Join the fun of the Pumpkin Pedal on Sunday, Oct. 5! This year’s 10-, 20- & 28-mile trail rides will be entirely on the Great Western Trail. The 40- & 65-mile road rides will be on roads but will utilize the same rest stops as the trail ride. They will all begin and end at Leroy Oakes Forest Preserve on Dean Street just west of Randall Road in St. Charles. This is a wonderful ride for families and serious riders. If you pre-register to ride with 5 or more team riders, you will all receive long-sleeved T-shirts. When registering you must choose the team rider ticket option and include the team’s name. Without the team name on your registration, we won’t know you are a team rider and you won’t receive a long-sleeved T-shirt. The start and finish for all the distances is Leroy Oakes Forest Preserve in St. Charles. Registration will begin at 7:30 a.m. and riders may start anytime between 7:45 a.m. and 10 a.m. The course will be cleared at 3 p.m. This event will take place rain or shine. If cancellation of the event is warranted due to dangerous weather conditions, announcements will be made event day at the event site. A post-ride meal will be served from 10:30 a.m. to 3 p.m. A vegetarian option will be available. For more information, contact Sandy Hutchins at 630-377-7250 or register here. Special Olympics athlete and Global Messenger Zinyra Ross of Aurora introduced Gov. Pat Quinn at a Brookfield Zoo press conference recently where he announced a $1 million investment for improvements designed for adults and children with disabilities. Zinyra is employed part-time at Brookfield Zoo, working the animal exhibits and children’s play zoo. 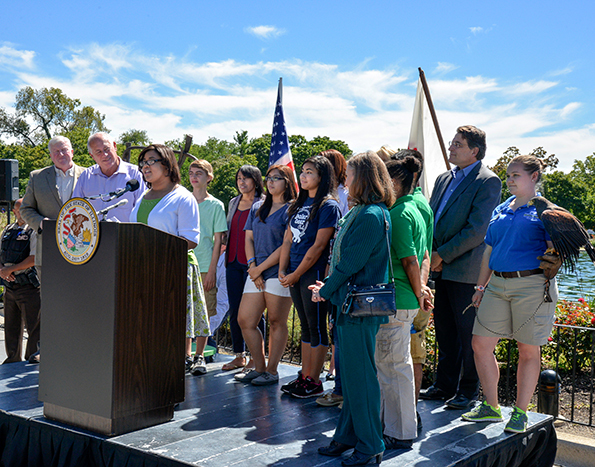 She was proud to speak on behalf of Brookfield Zoo for people with disabilities. Our friends at Stand Up For Downs are partnering with Special Olympics Illinois for The Big Windy, an incredibly entertaining night of comedy, food, drinks, silent auction and dueling pianos on Saturday, Sept. 27 at Fitz’s Spare Keys in Elmhurst. Headlining the night will be Matt Braunger (cast of Mad TV and NBC’s Up All Night, Letterman, Conan and others). Chicago’s own Pat McGann also will perform and both are guaranteed to have guests laughing throughout the evening. Rob Snow, founder of Stand Up for Downs, organized the event which will include an impressive silent auction for guests to bid on. The 8th annual NELARUSKY concert was held on July 30 to raise funds for Special Olympics Illinois. 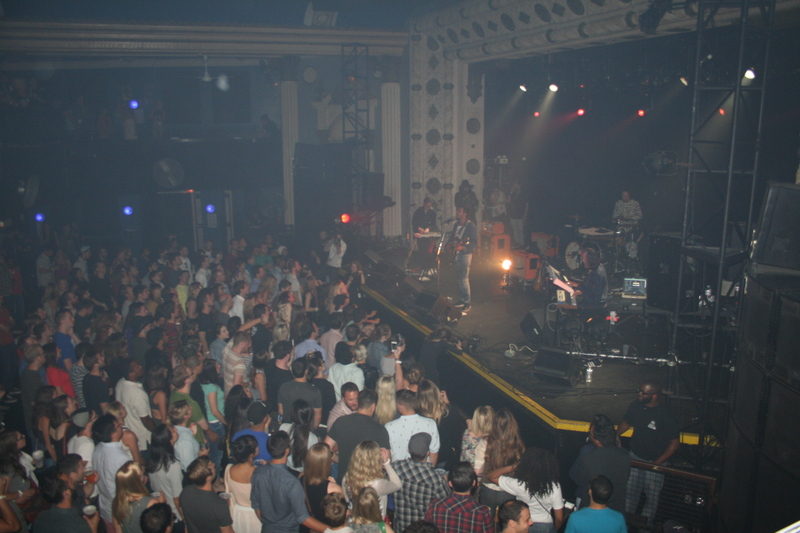 The concert was an official Lollapalooza aftershow attended by hundreds of fans. Event organizer Lauren McClusky worked with a committee for months in advance of the fundraiser. The concert featured performances by Dominican-born, Los Angeles-based new wave/chill wave/synth pop artist Twin Shadow; electronic musicians Sylvan Esso; and Chicago based indie rock band Santah. The event earned more than $40,000! Young entrepreneur Lauren McClusky has been in charge of NELARUSKY for eight consecutive years and kicked off her first benefit concert as a high school student. Special Olympics Illinois Global Messengers Christine Maxwell and Barbara Kozdron spoke from the stage thanking the audience for their support. Sponsors included: KPMG. Sterling Partners, Q101.1, Inner Workings, JIRA, Laurus Strategies, Premier Foundation, the William & Mary Ann McGrath Foundation, Bluewater Music Services Corporation, the Foster Family Trust, the CSIG Foundation, The Windish Agency, KIND, Ocean Tomo, Lance Rodgers, JMA Productions, Hertz Lichtenstein & Young, Premier Foundation, Republic Records, Red Light Management, Audiotree, Cozzini Group, Jeff McClusky, Brad Schmarak, Steve Bartels, Scully Family, Stephan Muzrall, Skip Weller, Bruns Family, Goldman Family, Andrew & Marcia Rice, Mike Allen, Artists & Brands, Jim Peterik, HUB 51, Innerworkings, Revolution Brewery, Lagunitas Brewery and David’s Tea. Interested in an evening of music and food while sampling different wines and beer along with bidding on fantastic items? Join us for the 5th Annual Taste of Something Special, a wine-tasting and silent auction event benefit SOILL East Central/ Area 9. This event will be from 5-7:30 p.m. Thursday, Oct. 16, at The WalkWay in Mattoon. Tickets are $15 per person in advance or $20 at the door. If you purchase your tickets in advance, they can be redeemed at the door for a free wine glass or 16 oz. beer glass. Cash bar will be available. Attendees may also purchase the wines and spirts available for tasting that evening from the WalkWay and leave with those purchases in hand. To purchase tickets in advance, contact Vanessa Duncan at 217-345-2424 or email vduncan@soil.org. You may also even stop by MMAS Dairy Queen, 320 N. 19th St., Mattoon. 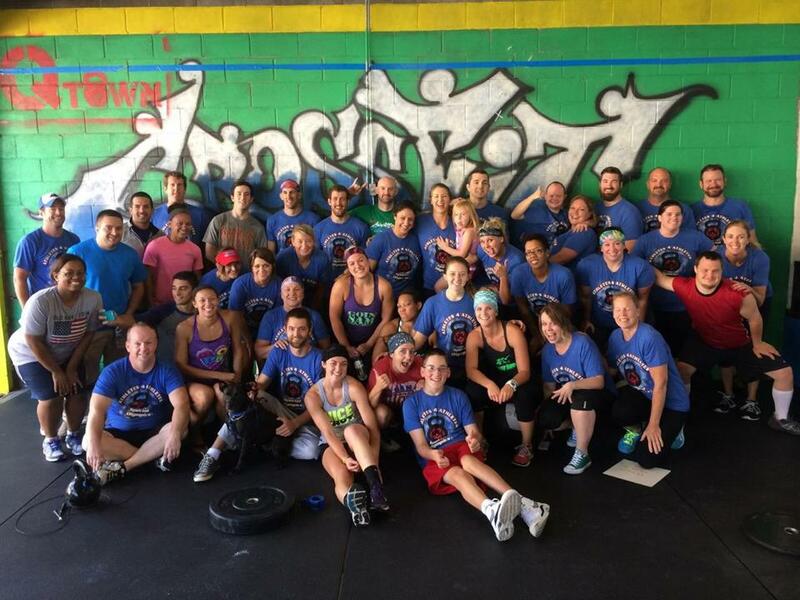 Davis approached Quincy’s Qtown Crossfit owner Katie Tappe about doing a fundraiser for Special Olympics even before she had the job. “She was in. 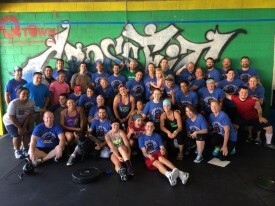 Then Crossfit coaches Christine Williams, Mike Davis, Tim Bliefnick and Jason Coplan got involved and it took off from there,” said Davis. Come support North Suburban Cook/Area 18 and enjoy tasting more than 40 wines from all over the world at the 3rdAnnual Corks for a Cause wine-tasting event. The event will be from 1-4 p.m. Saturday, Nov. 1, at the Tuscan Market and Wine Shop in Arlington Heights. You’ll also have the chance to bid on some great silent auction items. Tickets on sale through Eventbrite, so purchase yours today! Go to www.corks4cause.eventbrite.com!